Almost two years ago, I created my Twitter account (@PaulFritschner) and began to follow an account called Jayson Werth’s Beard (@JWerthsBeard). The real-life owner of this account remains anonymous, so we simply refer to it as the Beard. 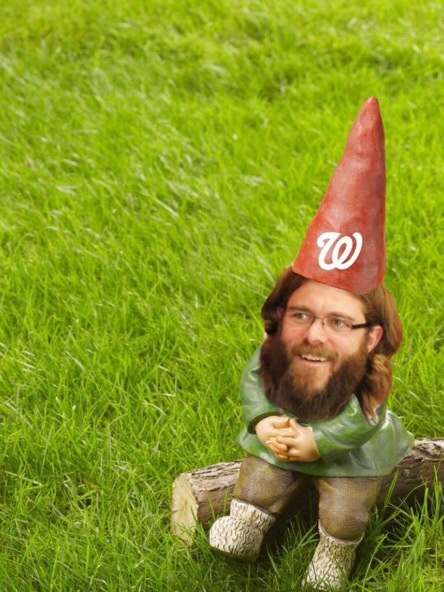 It posts creative photoshops relating to the Washington Nationals, possibly it’s most famous of which is a picture of Jayson Werth’s face photoshopped onto the face of a garden gnome. 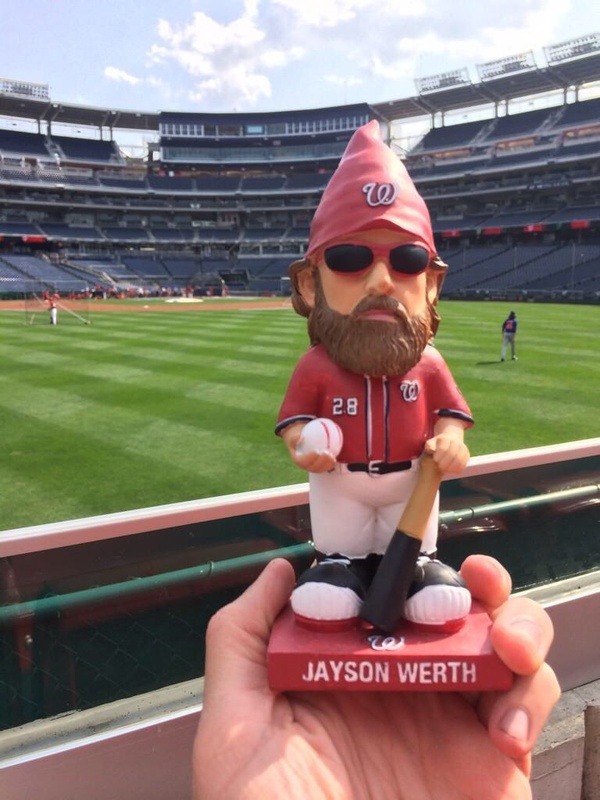 Back in February, the Nationals announced the promotional schedule, and wouldn’t ya know: August 5th was the Jayson Werth Garden Gnome. Bobbleheads do not usually matter much to me as far as a must-have giveaway, but after seeing all those crazy photoshops, I knew I had to get myself a gnome. You may ask, what’s the craze? It’s just a plastic garden gnome of a player. Maybe to you it’s a plastic garden gnome, but to the Nationals community it is a fantastic piece of baseball memorabilia. 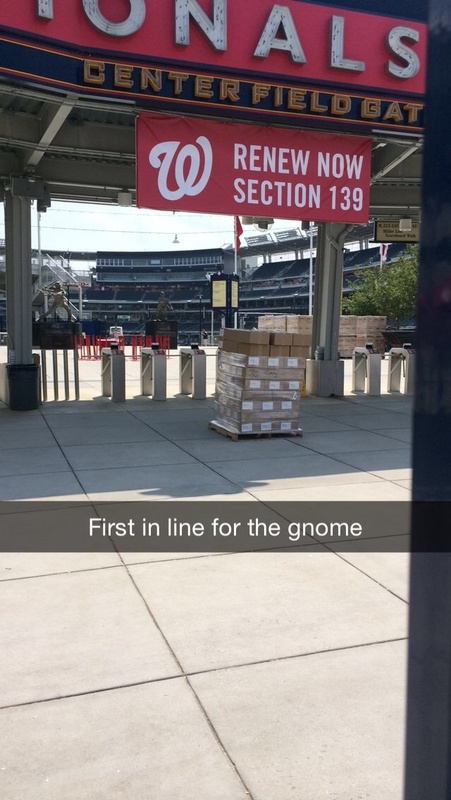 The day was getting closer and after seeing the lines for the Bryce Harper Bobblehead, along with all the promotion the Nationals were doing on social media for this gnome (also here), I knew the lines were going to be incredible. I thought to myself, well, if I’m going to get there so early to be able to get one, I might as well be first, right? In order to be first would mean a long wait. 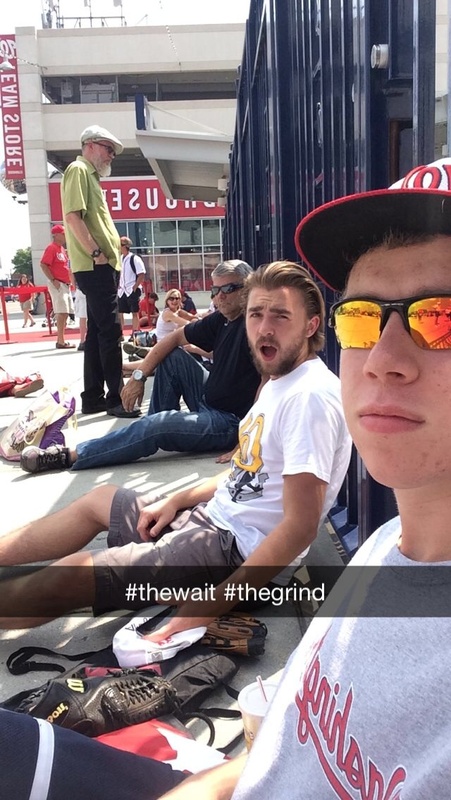 To aid in my relief from boredom, I asked my friend from school, Francis Bright, if he would attend the game with me and wait in line. He was all for it, and Gnome Gnight was set. We arrived downtown around 1:15 and when we couldn’t see a line at the gates forming yet, so we walked down the street to grab some lunch at Potbelly. We figured it would be a long, hot couple of hours, so we made sure we were adequately prepared. To my surprise, nobody was in line yet, and we walked up simultaneously with one other man to take our spot in a line. This was right around 2:10, and the gates opened at 4:30, so we now had about 2 hours and 20 minutes before we could receive our gnome. 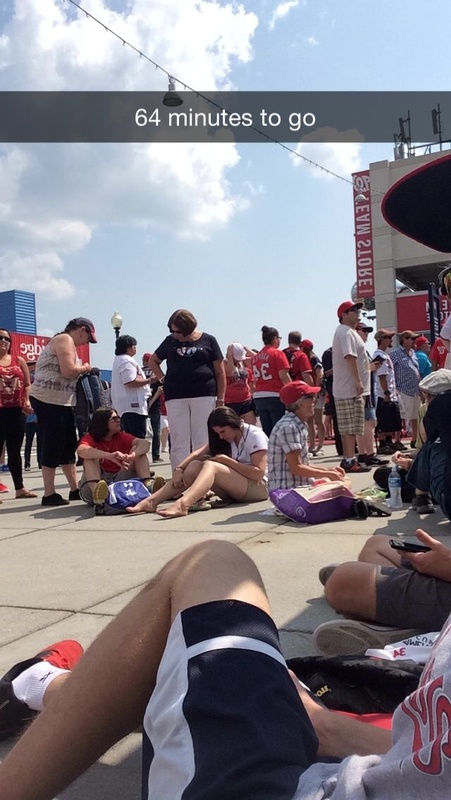 We brought our gloves for batting practice, and I had brought a ball, so we played catch for about a half hour until we decided we should sit at the gate so as to secure our place in line. This meant that we were relegated to finding a way to pass about two more hours. At 3:30, with exactly one hour left to go, I got a Direct Message on Twitter from Scott Allen, a sports writer for the Washington Post. 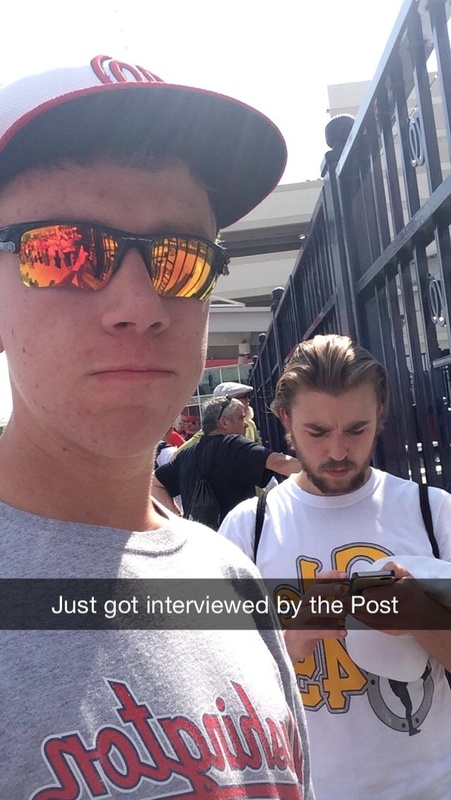 He asked if he could interview me about waiting in the line. I was ecstatic, and did the interview over the phone a few minutes later. I relayed the message to many people I knew about what had just happened, including podcast co-host Steve Miller. he was the first one to send me the link to the article after it was posted within minutes. I will include all the links to the article later in this post. The interview excitement helped the next few minutes go very quickly. All of a sudden there was less than a half hour to go, and the excitement was building. 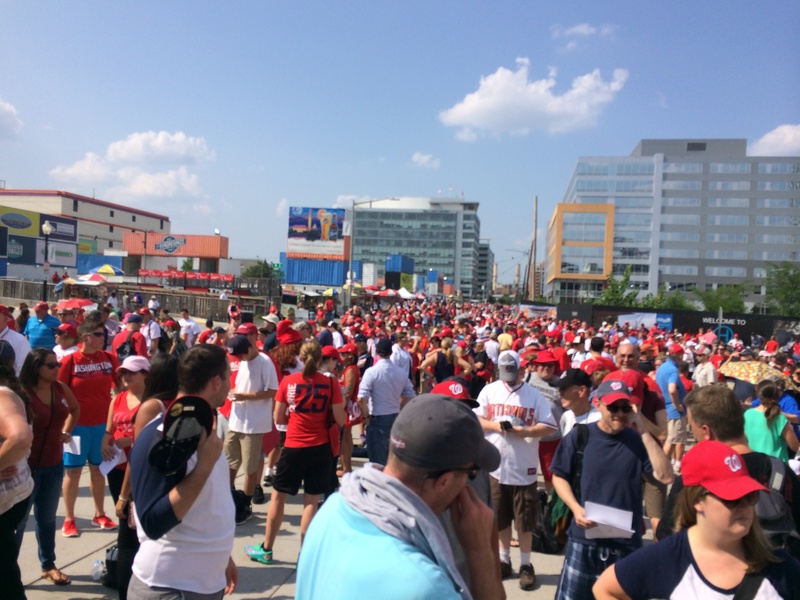 Throngs of people made their way down Half-Street from the Metro, anxious to take their place in line. The ushers began to prepare for the onslaught of gnome-hungry fans. 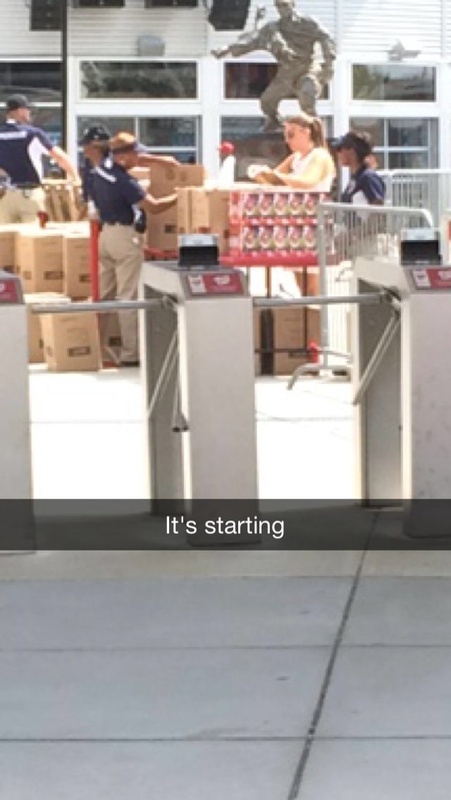 After all the time waiting, I was beginning to get somewhat anxious for the gates to finally open. 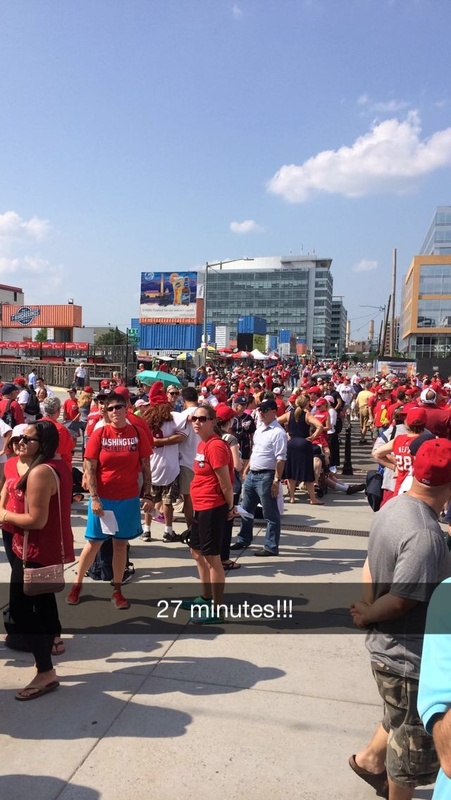 With seven minutes to go, it was now a sea of red down Half-Street and around the gates. 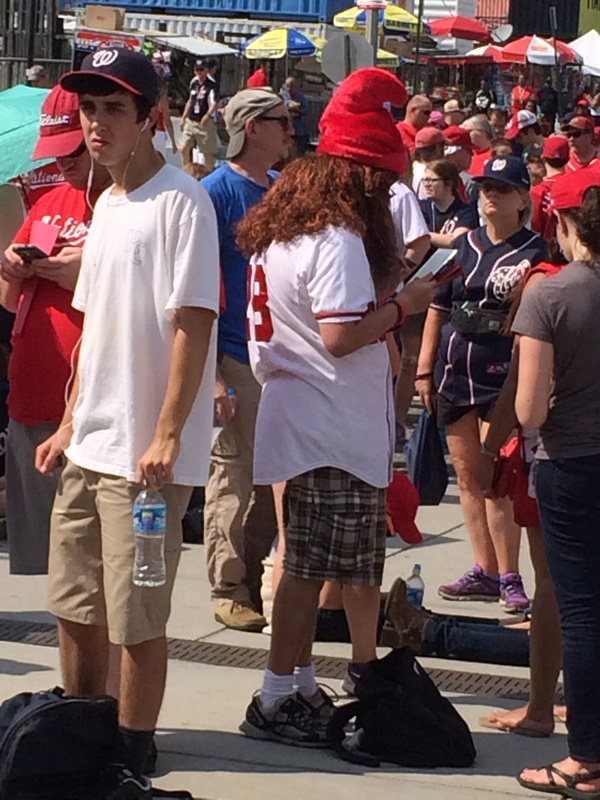 Then at 4:30, after nearly two years of photoshops, six months of waiting for this game, and almost two and a half hours at the gate, I had my hands on a Jayson Werth Garden Gnome. As an added benefit to being in the front of the line, this meant prime position in the Red Porch to take in batting practice. Francis got a ball right after we had gotten ourselves situated when, who I believe was, Tanner Roark launched a ball that bounced off the field and up into the seats. It was now my turn for a ball of my own. 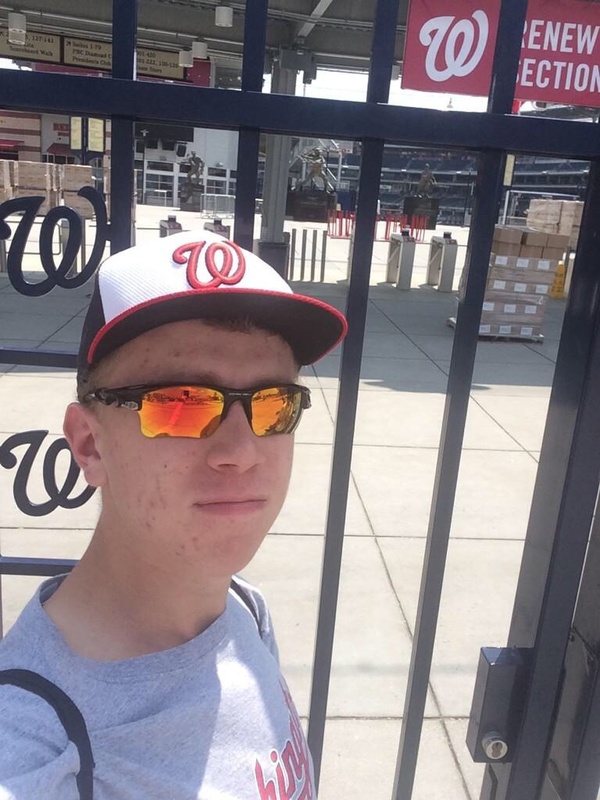 Since I was little, I have attended Potomac Nationals games, as I wrote about in my very first post. I have collected dozens of baseballs from those games and many baseballs from Major League games, but even after all these years, I have never caught a ball on the fly. As in, catch a foul ball or a home run before it hits the ground. I’m always having to chase after them. I made it my goal to catch at least one before I go off to college next year, and I thought that maybe after all the good things that happened, today would be the day. 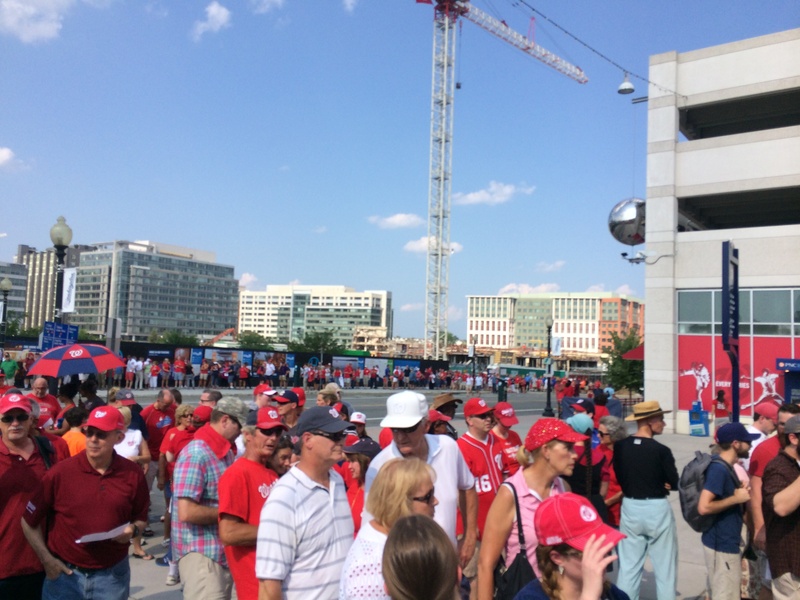 Sure enough, Danny Espinosa (99% positive it was him) launched a home run right to where I was standing. It was only a matter of whether I or the few other people standing around me would get it. I stuck my glove way up (shades of The Sandlot), and the ball smacked right into my glove. I had finally been in the right place at the right time. The day was now on another level. 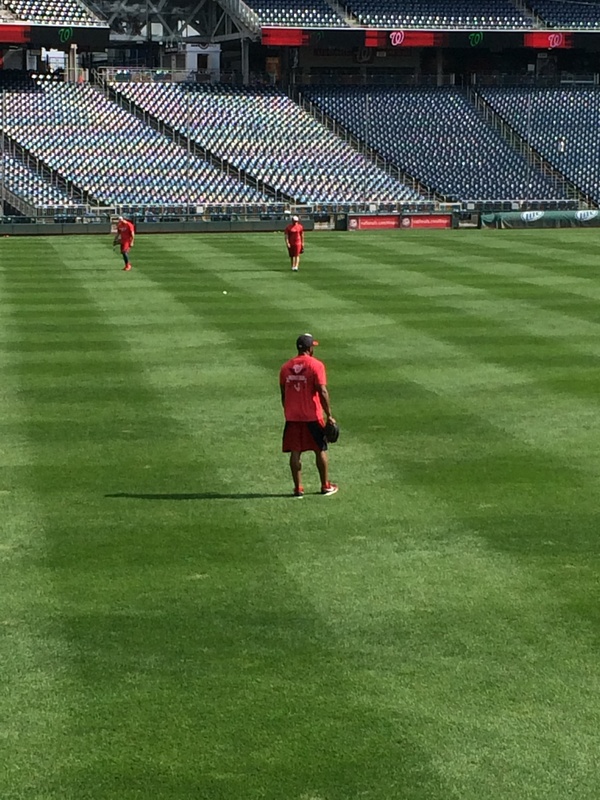 Francis and I watched the Nationals finish up batting practice and proceeded to watch the Mets. 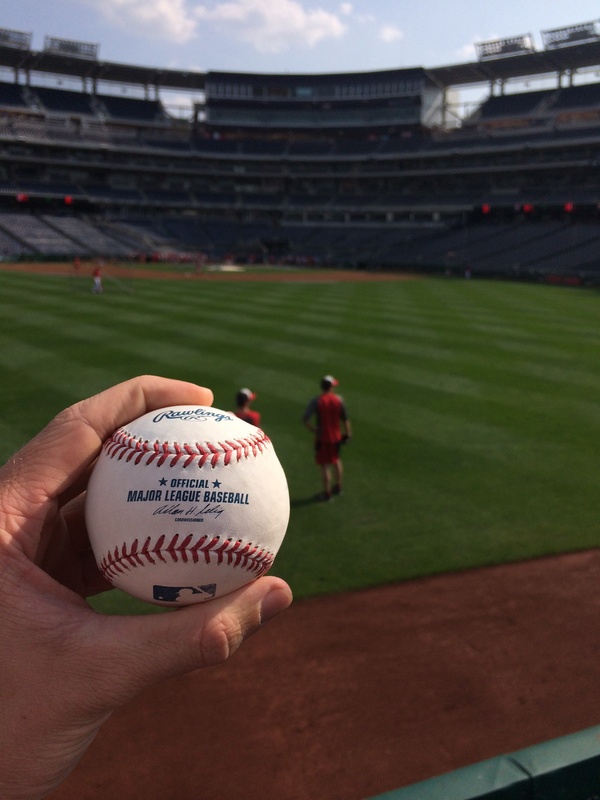 We didn’t catch any more baseballs, but I was plenty satisfied. I had my gnome, a baseball, and an interview. 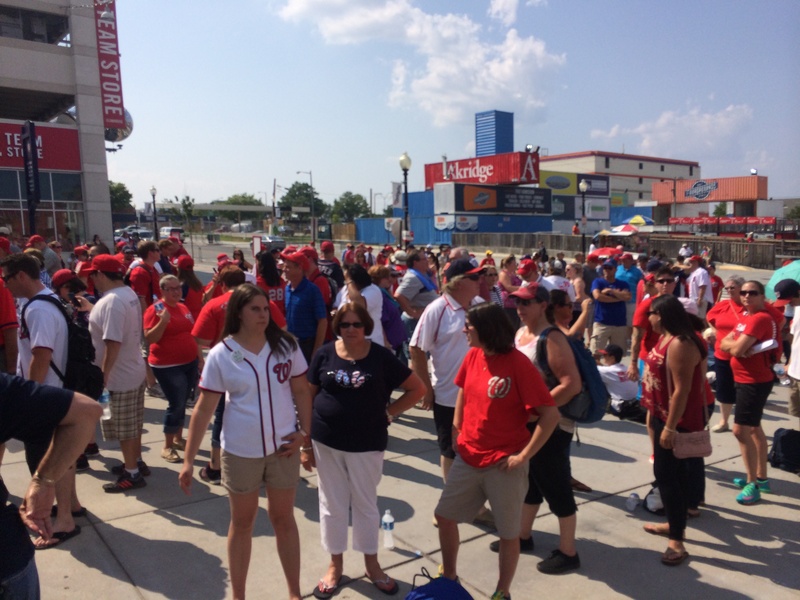 Now all we needed was a Curly W.
Lefty Gio Gonzalez started for the Nats, opposed by Zach Wheeler for the Mets. Gio gave up a triple in the first inning to Daniel Murphy, who later came in to score to make it 1-0. 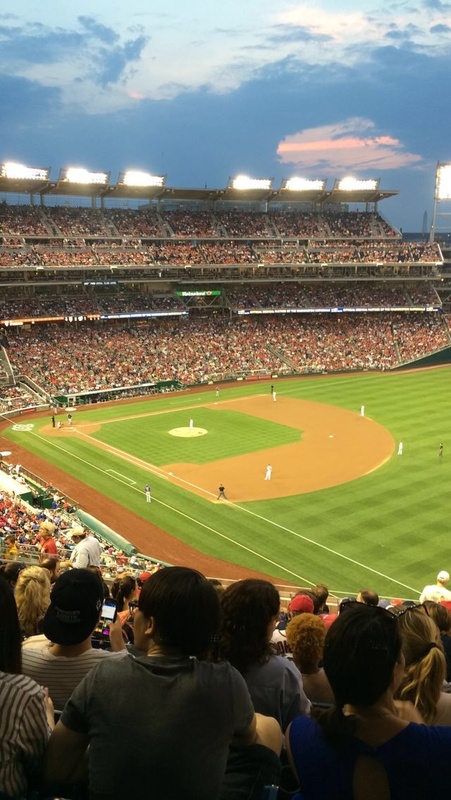 The Mets added another run in the top of the second before the Nats answered with a run of their own in the bottom of the second on a wild pitch to make it 2-1. Both pitchers began to settle into a groove, but the groove for Gio would only last so long. The Nats could not provide him with much run support, even squandering a scoring opportunity when a groundball hit Asdrubal Cabrera. Ian Desmond had to return to third base and did not end up scoring, thus leaving the Nationals still at a deficit. 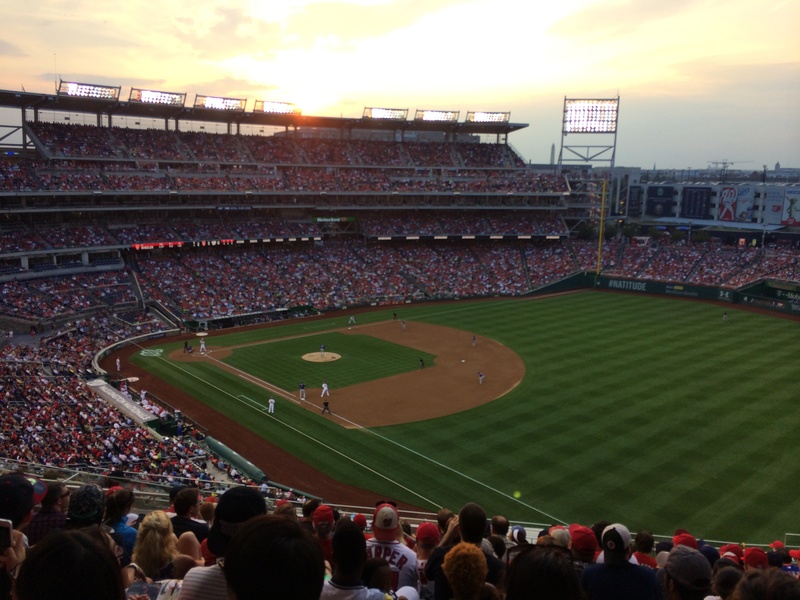 Gio began to struggle in the 7th inning with the Nats still trailing 2-1. 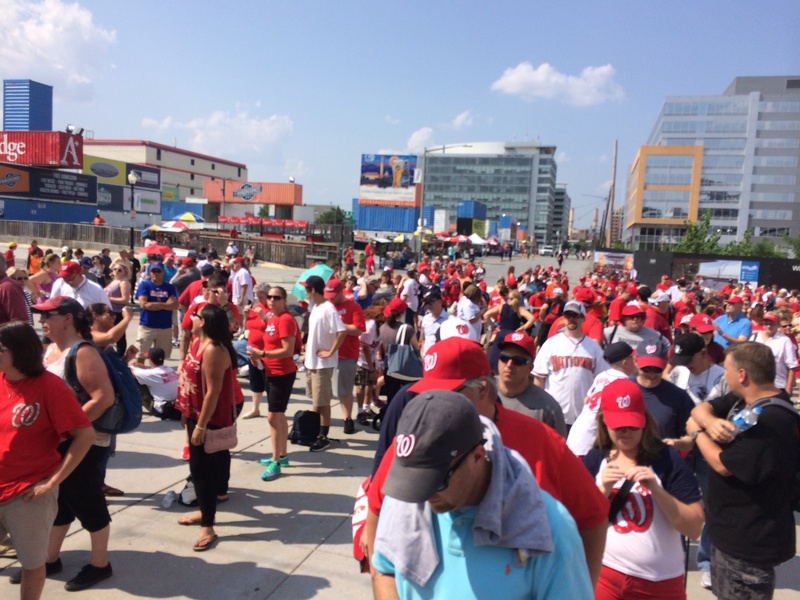 Drew Storen replaced him with men on first and second, both of whom came in to score after a sacrifice bunt by Wheeler and a single by Daniel Murphy. 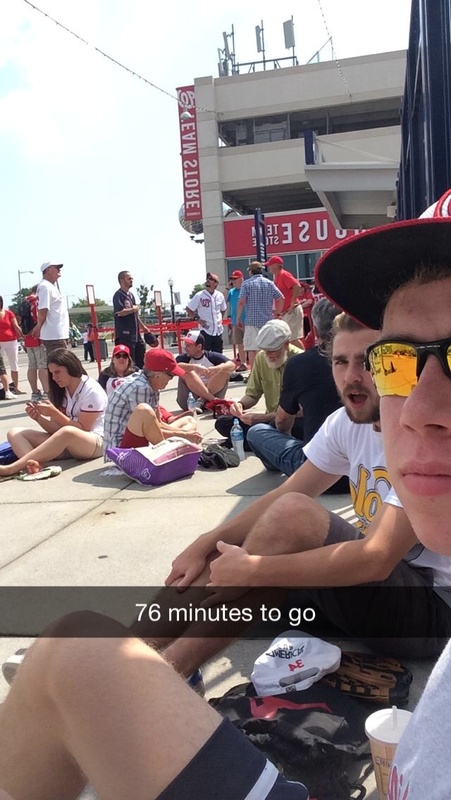 The Nats gave up one more run in the 8th inning to make it 6-1, the eventual final score. They could not muster much of a rally in the game’s final two innings, leading to a defeat on Gnome Gnight. A Curly W was not in the books after all. 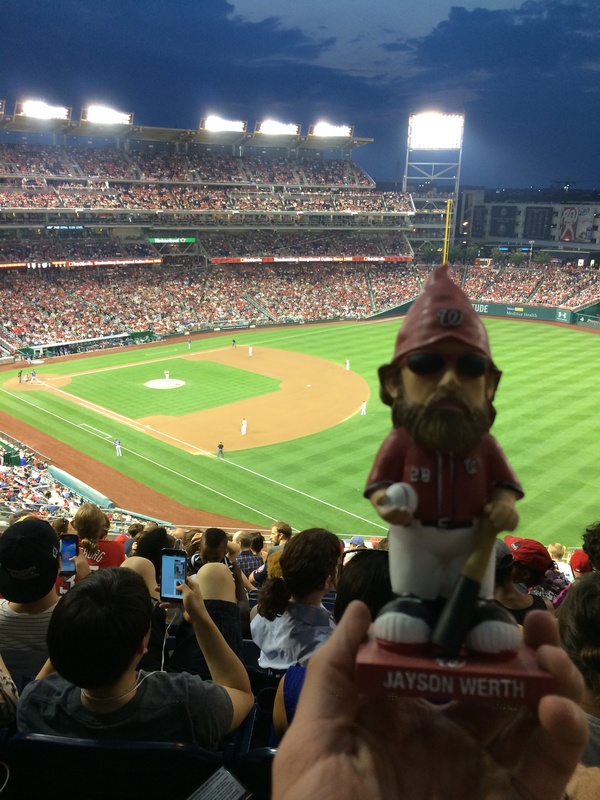 Jayson Werth himself did not get a gnome, and said post-game of the 15,000+ who didn’t receive one, “I know how they feel.” Also an interesting statistic I read from Scott Allen today. 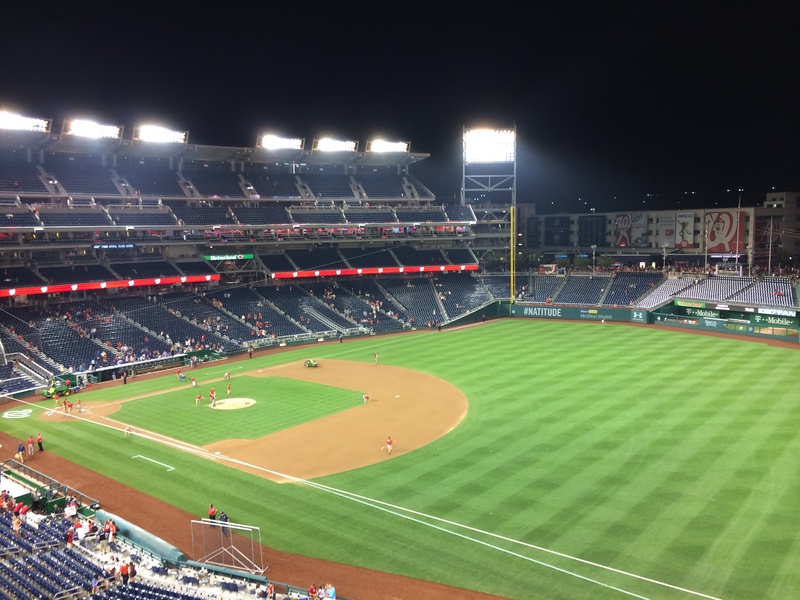 This season, the Nats are 1-6 when playing in front of 40,000+ people and 2-10 when playing in front of that many since 2013. However, while the actual game may not have been fantastic, basically everything else about the day was. The interview took off and was posted in various articles across many different websites. The original article, written by Scott Allen of the Washington Post, can be found by clicking here. A section of USA Today called For the Win picked it up, the article for which can be found here. The website Deadspin also did a piece of their own on the line for the Gnomes and their article can be found here. 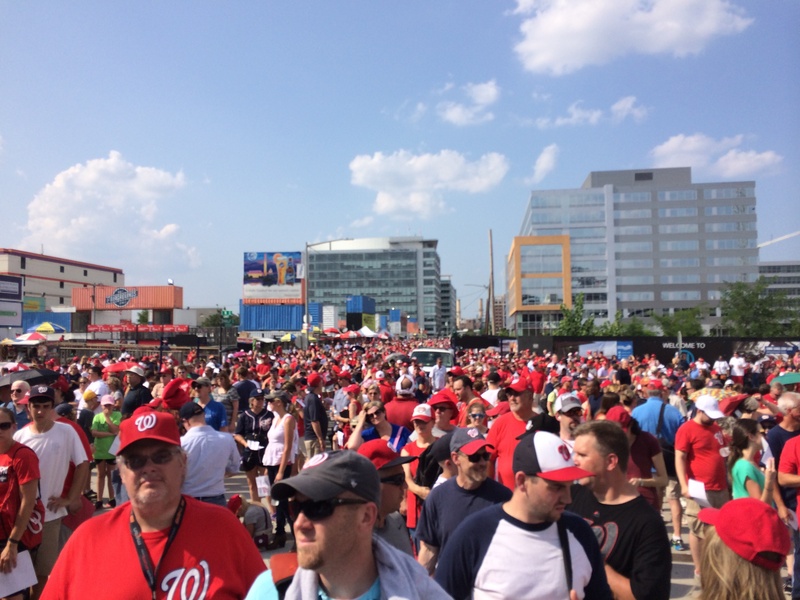 We were hyperlinked in an article on the NBC Washington website and that can be found here. Finally, for those curious, the gnome is being sold on eBay for over 150$. So if you think its just a cheap giveaway, it’s a giveaway that could earn you some money if you wanted to sell it. Check out the bids here. I for one will be keeping my gnome. Please be sure to subscribe to my blog via email on the right side of this page. You will not receive any junk mail, just an email whenever I post. Here are some more pictures from the rest of Gnome Gnight. It was really a fun day; a day I will not forget for a long time. Way to go Paul! Your tenacity paid off! And you certainly no how to get publicity! Thanks Mr. Shondelmyer! It was a lot of fun, I had a great time.